The precept given by the angel to Samson's mother shows, however, that the people in general did not heed the dietary laws. The same may be inferred from Ezekiel's words concerning himself as priest: "Ah, Lord God! behold my soul hath not been polluted: for from my youth up even till now have I not eaten of that which dieth of itself, or is torn of beasts; neither came there the flesh of a sacrificially loathsome thing ; A. V. "abominable flesh"] into my mouth" (Ezek. iv. 14; compare Ḥul. 37b, where the rabbinical interpretation of the passage is given). In fact, Ezekiel desires the prohibition of Nebelah and Ṭerefah to be applied to priests only: "The priests shall not eat of anything that dieth of itself or is torn, whether it be fowl or beast" (Ezek. xliv. 31; see Men. 45a, "The prophet Elijah shall some day explain this problematic passage"). Thus it is simply an extension of the priestly law to the whole nation, as "holy to the Lord," which underlies the prohibition of nebelah and ṭerefah (Ex. xxii. 30 [A. V.], 31; Deut. xiv. 21; Lev. xvii. 15, xxii. 8). On the other hand, the prohibition of blood and fat (Lev. iii. 17, vii. 24-27, xvii. 10-14; compare Gen. ix. 4) rests on different grounds. Maimonides ("Moreh," part iii., ch. xlvi., xlviii.) gives a rationalistic explanation. "Blood and fat belong to God, and must be brought upon the altar" (Targ. Yer. to Lev. iii. 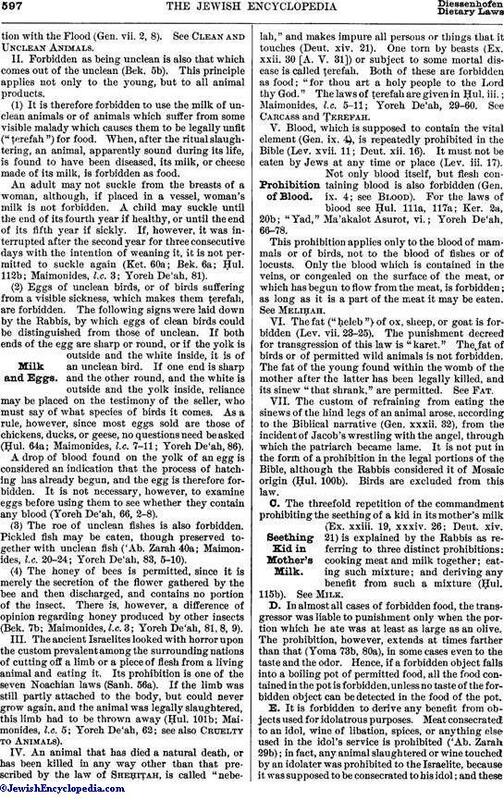 17); they are divine property; neither Israelite nor non-Israelite is allowed to eat thereof; and the penalty for violation of this law is excision ("karet"). Therefore, the blood of every animal, even when it is unfit for the altar, must be "poured out . . . as water" (Deut. xii. 24), and the fat of the nebelah and ṭerefah is forbidden (Lev. vii. 24). In Deuteronomy (xii. 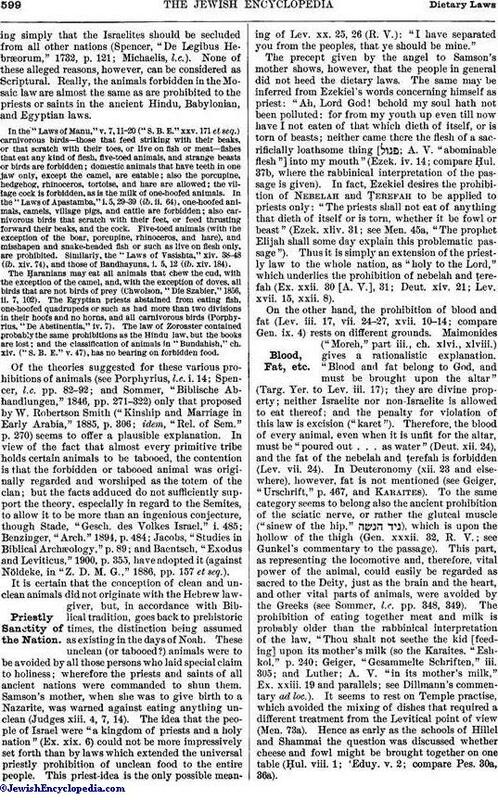 23 and elsewhere), however, fat is not mentioned (see Geiger, "Urschrift," p. 467, and Karaites). To the same category seems to belong also the ancient prohibition of the sciatic nerve, or rather the gluteal muscle ("sinew of the hip," ), which is upon the hollow of the thigh (Gen. xxxii. 32, R. V.; see Gunkel's commentary to the passage). This part, as representing the locomotive and, therefore, vital power of the animal, could easily be regarded as sacred to the Deity, just as the brain and the heart, and other vital parts of animals, were avoided by the Greeks (see Sommer, l.c. pp. 348, 349). 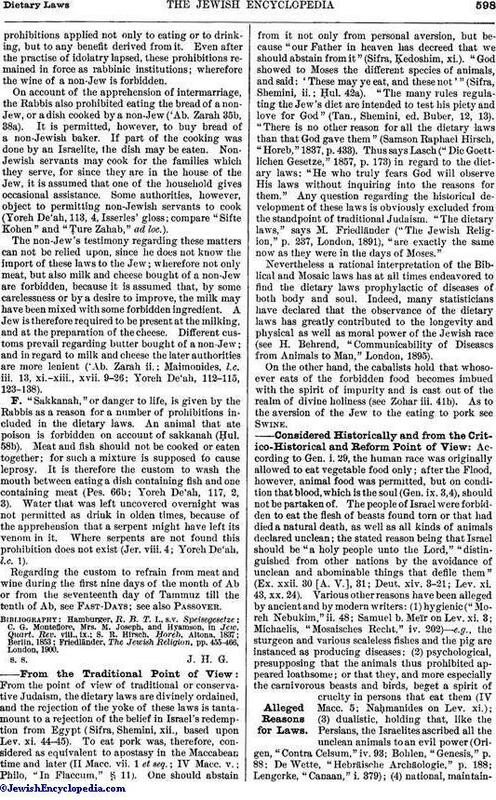 The prohibition of eating together meat and milk is probably older than the rabbinical interpretation of the law, "Thou shalt not seethe the kid [feeding] upon its mother's milk (so the Karaites, "Eshkol," p. 240; Geiger, "Gesammelte Schriften," iii. 305; and Luther; A. V. "in its mother's milk," Ex. xxiii. 19 and parallels; see Dillmann's commentary ad loc.). It seems to rest on Temple practise, which avoided the mixing of dishes that required a different treatment from the Levitical point of view (Men. 73a). Hence as early as the schools of Hillel and Shammai the question was discussed whether cheese and fowl might be brought together on one table (Ḥul. viii. 1; 'Eduy. v. 2; compare Pes. 30a, 36a). 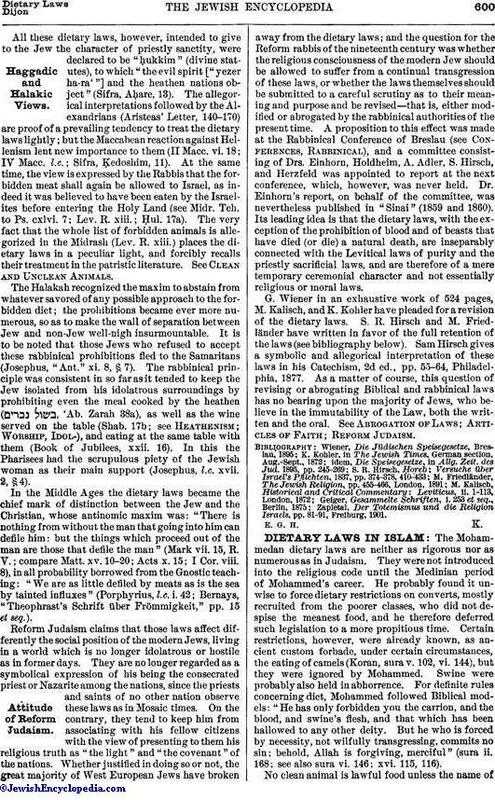 The Halakah recognized the maxim to abstain from whatever savored of any possible approach to the forbidden diet; the prohibitions became ever more numerous, so as to make the wall of separation between Jew and non-Jew well-nigh insurmountable. It is to be noted that those Jews who refused to accept these rabbinical prohibitions fled to the Samaritans (Josephus, "Ant." xi. 8, § 7). The rabbinical principle was consistent in so far as it tended to keep the Jew isolated from his idolatrous surroundings by prohibiting even the meal cooked by the heathen ( 'Ab. Zarah 38a), as well as the wine served on the table (Shab. 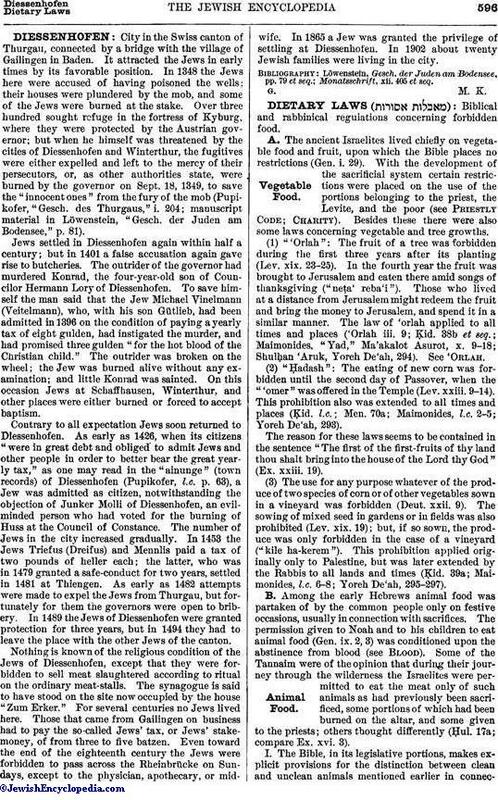 17b; See Heathenism; Worship, Idol-), and eating at the same table with them (Book of Jubilees, xxii. 16). In this the Pharisees had the scrupulous piety of the Jewish woman as their main support (Josephus, l.c. xvii. 2, § 4).